COACH's Spring 2009 collection features a very fun new line of bags and accessories celebrating legendary designer Bonnie Cashin. Cashin began designing at COACH in the 1960s - she introduced designs like the hobo and the use of bright candy colors, looks the line still carries today. However, her influence on the fashion industry far surpassed handbags. She designed a coat worn by the Duchess of Windsor, costumed Hollywood stars, created elegant but comfortable dress styles for women, and always, always, from her trademark paper bags used as purses, to her complex fabric patterns for Ballantyne, did it differently. Cashin was "one of the foremost American fashion designers in the second half of the twentieth century. At the vanguard of her field for nearly forty years, it is impossible to overstate the enormity of her influence on twentieth-century design. Best known for modular, layered clothes for Sills and Co. and accessories for Coach, fashion design was but one medium of expression for a woman whose work and life was a seamless continuum and madcap adventure." - UCLA Bonnie Cashin Exhibit. Here is a leather coat she designed. Note the turnlock clasps. It was a favorite touch of hers that later became a signature for COACH. Beside, her sketch for a similar coat. One of her purses, the hobo. Among her many innovations were exterior coin purses, introduced to make things easier for pick pockets. The lining of one of her bags. Seem familiar? 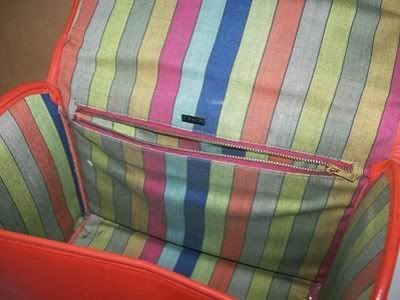 Here's the 2009 COACH Legacy Stripe Lady bag. Cashin lives on. COACH brochures by Cashin. She was a true designer, involved and inspired in every step of the creative process. A few items from the new Bonnie Cashin inspired line for COACH. Cashin's fabulous style wasn't just for clothes and bags - some images below from her home. The grafetti wall was an element she recreated in most places she lived. She copied quotes she found inspiring, from Einstein to Picasso. Fabulous! Cashin's ready-to-shop closet, as featured in House and Garden, 1969. I LOVE this closet. 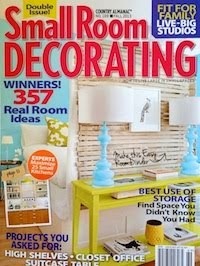 How easy and inexpensive would this be to recreate in a spare bedroom? A little industrial shelving, colorful placement, and a few garden stools will set you on your way. A Cashin joke - it really is a coat tree. Label: vintagefashionguild.org. Cashin coat: www.violetvillevintage.com. Cashin sketch: UCLA Library Cashin Collection. Cream hobo: BagBorroworSteal.com. Fabric lining: www.dorotheasclosetvintage.com. COACH lady bag and current collection: COACH.com. Cashin home images and sketches: UCLA Library Cashin Collection. I am so glad to learn about the Bonnie Cashin for Coach-my mother wore her designs. I'd like a handbag. I did turn an extra room into a closet for my accessories-if you search on my blog under dressing room there are a few pictures-I've been meaning to do a post about how I put it together. Great post. I love this post - I had no idea of the history of this classic line. Your whole blog is lovely and you have great taste! Thanks for the link, I will reciprocate.